How to create an SPF TXT record? What is a DMARC record? How to create a DMARC record? Managing governance and authentication of all your message streams is complicated. Enterprises have multiple email channels for marketing, corporate and other applications. Third parties forwarding your emails can create the additional complexity of email server authentication support. Your DMARC deployment team needs to take this into account to ensure that you can safely block fraudulent and spoofed email. DMARC Analyzer is one of the pioneers of DMARC and has been helping customers since the introduction of the DMARC standard in 2012. Our DMARC deployment and project management specialists can help you with managing your DMARC project, mitigate risks, allow you to safely block malicious emails without impacting your other email channels like marketing, transaction, etc. On-going management and reporting process will ensure a successful deployment, project and risk management. It will support your Email Governance program with full visibility and control over the emails sent on behalf of your domain(s). With Managed Services, DMARC Analyzer will be your extended DMARC team to protect all of your domains. A DMARC specialist will be available to provide support and expert advice. In the event of an email phishing or security incident, we can assist with message level details and forensic investigation to help your incident response team on the source of attacks, size of attack and share insights on other indicators of compromise. Managed Services frees you from day-to-day costs and complications of monitoring and troubleshooting tasks associated with a DMARC deployment project. With Managed Services a DMARC specialist will pro-actively guide you through each phase of the DMARC deployment and the maintenance process. Together we will follow the steps needed to move the DMARC policy from monitor to quarantine and after that to 100% reject. It saves you time in troubleshooting the authentication failure issues, minimize the risk of inadvertently blocking legitimate emails and quickly start benefiting by blocking spoofed and phishing emails. Before setting up your DMARC Analyzer account, we will provide you with a detailed project plan. With this, it is easy for your DMARC team to start deploying DMARC Analyzer. A DMARC specialist will continuously monitor your progress towards the 100% reject policy. You will receive reports from a DMARC specialist including specific tips per domain. When needed we will discuss these reports in bi-weekly calls. Monitoring and interpretation of your DMARC data collected from Google, Yahoo, Outlook, and others. 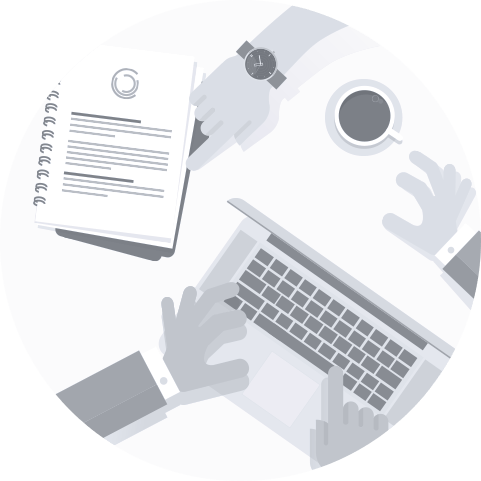 Tailored reports aimed at your DMARC project and expert advice to help your DNS, Email and other team members to setup DMARC records accurately. Please provide us some basic information about the level and type of service you are considering, how many domains your dealing with, volume expectation and the most convenient method of contacting you. One of our DMARC specialists will respond to your request promptly to have an initial conversation related to your desire. DMARC Analyzer is a pure play DMARC specialist with over 15 years of email deliverability experience. We provide user friendly DMARC Analyzer software and we act as your expert guide move towards a reject policy as fast as possible.